Superior Casino brings you the latest casino slot contest. Read carefully below how you can earn a Free No-deposit $50 Bonus this week! But first we have some exciting news for you all. A new 5-reel slot machine game is coming soon to Superior Casino. It looks like a lot of fun and is sure to make you laugh once you start spinning those reels. It will feature a funny bonus round, free spins with 3x multiplier and an expanding wild in the center reel. Play this slot game from our Instant Flash Casino lobby. To receive a complimentary $50 No-Deposit Bonus on Monday 25th! How? Simply wager at least $25 in this game during this current week. You have till Sunday Jan. 24th to complete just $25 worth of bets in Eggstravaganza and the Free $50 Bonus is yours! 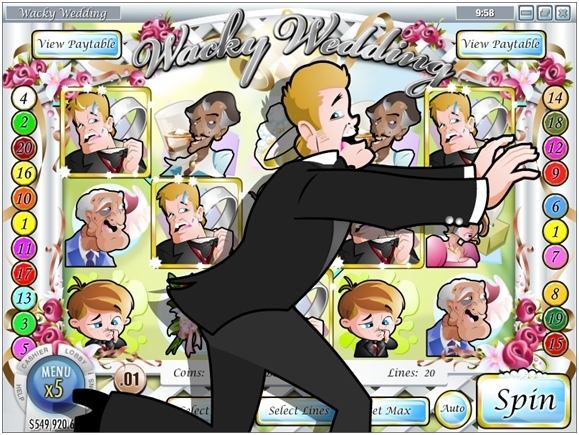 Stick around so you can be the first to play Wacky Wedding as soon as it is released. We’ll be sure to have a good slot contest for that game once it is live at Superior Casino. « Newest Online Casino Game Contest: Claim your Free Bonus!